Everyone can try pressure washing their home’s exterior on their own. However, surfaces may accidentally get damaged if the process is done without the proper knowledge and equipment. That’s why it’s best to hire experts for professional pressure washing services in Cuyahoga Falls, OH. Wilhelm Power Washing is dedicated to providing stellar pressure washing services in Cuyahoga Falls, OH. By investing in state-of-the-art tools and skilled workers, we meet and even exceed the expectations of our clients. If you need professional pressure washing services in Cuyahoga Falls, OH, turn to us. What Are Pressure Washing Services in Cuyahoga Falls, Ohio? Pressure washing services in Cuyahoga Falls, OH refer to processes that use high-pressure water spray to clean mold, grime, or loose paint off the exteriors of houses and buildings. 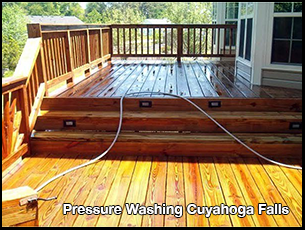 Pressure washing services in Cuyahoga Falls, OH are typically done for structures with hard surfaces, such as roofs, decks, fences, patios, and sidewalks. To ensure optimal results for your outdoor cleaning projects, consider pressure washing services in Cuyahoga Falls, OH performed by Wilhelm Power Washing. At Wilhelm Power Washing, we care about delivering top-notch pressure washing services in Cuyahoga Falls, OH. That’s why we use solutions and soaps that thoroughly clean your exterior surfaces without harming the flowers, trees, and grass on your property. If you’re looking for unparalleled pressure washing services in Cuyahoga Falls, OH, hire our professionals. Pressure washing services in Cuyahoga Falls, Ohio are performed by technicians using excellent equipment. When you choose our pressure washing services in Cuyahoga Falls, OH, we’ll use top-of-the-line, commercial-grade tools to restore your property’s surfaces to their former glory. Whether you need your roof or siding cleaned, you can rely on us for our pressure washing services in Cuyahoga Falls, OH. Pressure washing services in Cuyahoga Falls, Ohio are performed by professionals with expertise in the process. Our pressure washing services in Cuyahoga Falls, OH are performed by workers who have been in the industry for years. When you choose our pressure washing services in Cuyahoga Falls, OH, you’ll benefit from skills that have been honed by years of training and experience. Before rendering our pressure washing services in Cuyahoga Falls, OH to any client, we determine the techniques and solutions that best fit the situation. Once we have performed our pressure washing services in Cuyahoga Falls, OH, expect the stubborn stains to be gone. We’ll leave your exterior surfaces spotless! Hiring a company to perform pressure washing services in Cuyahoga Falls, Ohio is cost-effective. If you plan on pressure washing your property yourself, you have to either buy the right tools or rent them. What’s more, if you don’t do the task correctly, you might end up damaging the surfaces you’re trying to clean. This can result in added repair costs. To save money, it’s best to hire a provider of pressure washing services in Cuyahoga Falls, OH. You won’t have to buy new equipment, as we have the tools needed to provide pressure washing services. Cuyahoga Falls, OH clients can rest easy knowing that we will take the necessary measures to ensure clean, damage-free surfaces. Pressure washing services in Cuyahoga Falls, Ohio performed by experts are safer. Performing pressure washing services in Cuyahoga Falls, OH often entails climbing up ladders to clean high areas, such as the roof. Additionally, high-pressure cleaning equipment sprays water with tremendous force. If you accidentally point it at a person, it can cause bruises and lacerations. If you want clean exteriors without compromising your own safety, you can’t go wrong with hiring our well-trained team for pressure washing services in Cuyahoga Falls, Ohio. We have the right washers to access even elevated areas. Don’t risk getting injured by attempting to do pressure washing yourself. Let us provide you with pressure washing services in Cuyahoga Falls, Ohio instead. You get to relax and enjoy the day with your loved ones while we do the dangerous work. Need assistance with an outdoor cleaning task? Our professional pressure washers can help you! We provide first-rate pressure washing services in Cuyahoga Falls, Ohio at fair and honest rates. When it comes to pressure washing services in Cuyahoga Falls, OH, Wilhelm Power Washing can bring results that are nothing less than exceptional. Learn more about our pressure washing services in Cuyahoga Falls, OH by visiting www.wilhelmpowerwashing.com. As a property owner, you want the exteriors of your property to always look clean and presentable. However, no matter how much you try, it’s inevitable that your home or office will become filthy. With the passing of time comes an accumulation of dust and dirt, as well as the growth of mildew, mold, or moss. These contaminants will not only make your commercial building or residential home look dirty but also expose you to health risks. Before you or anyone else gets hurt, you should turn to Wilhelm Power Washing. With our expert power washing and painting services, we ensure that your commercial building or residential home will start looking as good as new. We are committed to your satisfaction and safety; as such, we only use top-of-the-line washers, paint, and cleaning solutions for each of our jobs. At Wilhelm Power Washing, we specialize in power washing and house paint. When you hire us, you’ll be glad to find that our experts pay great attention to detail. We do our best to ensure that you get a quality job every time. With power washing, all the dirt and grime on your premises will be washed away. Using high-pressure water blasts, heat, and soap, we can make your home look brand new. We don’t use just any soap, either; we utilize a safe, environmentally friendly, and biodegradable cleaning solution that not only removes stubborn stains but also keeps mold from returning!